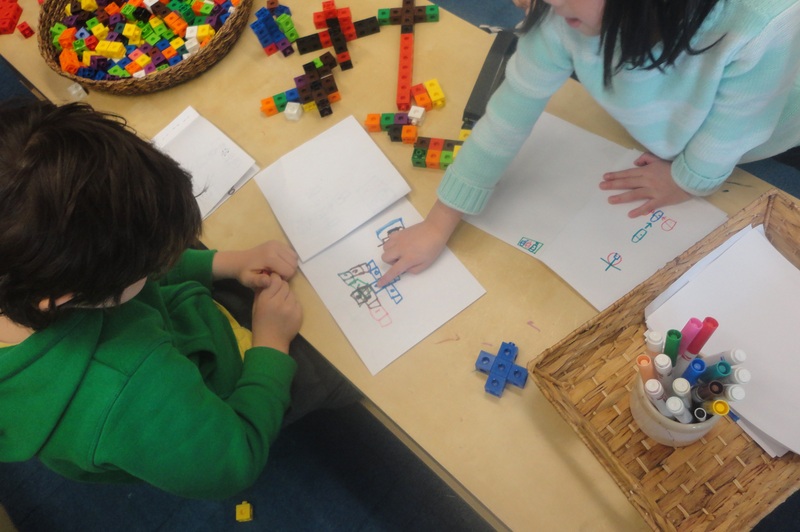 In preparation for September, I have been looking back at photos from our learning last year and reflecting on what made certain provocations successful (or not). 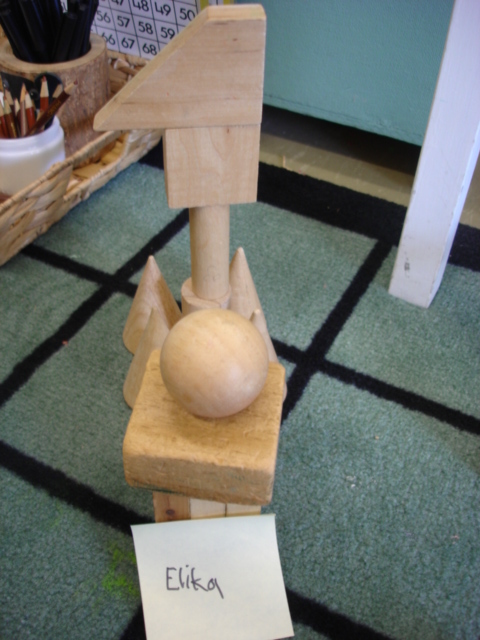 In doing so, I came across a series of photos from an exploration we did on 3D shapes. This particular learning story caught my attention because I noticed how I had started with one question/idea for my students to explore and then changed it as I observed the children interacting with the materials. 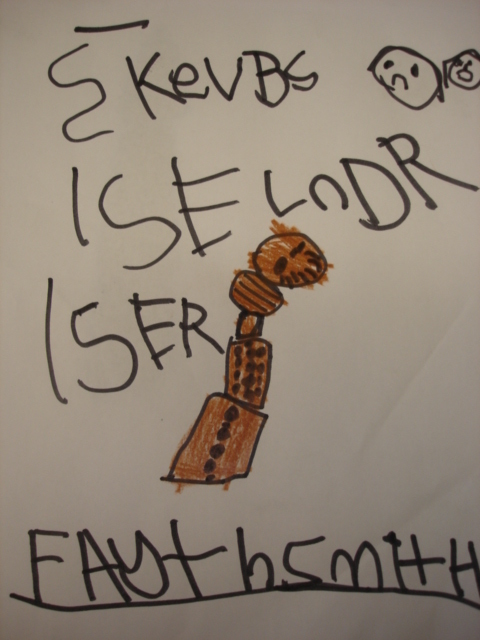 In my first provocation, I asked the children if they could build a tower using 3D shapes. 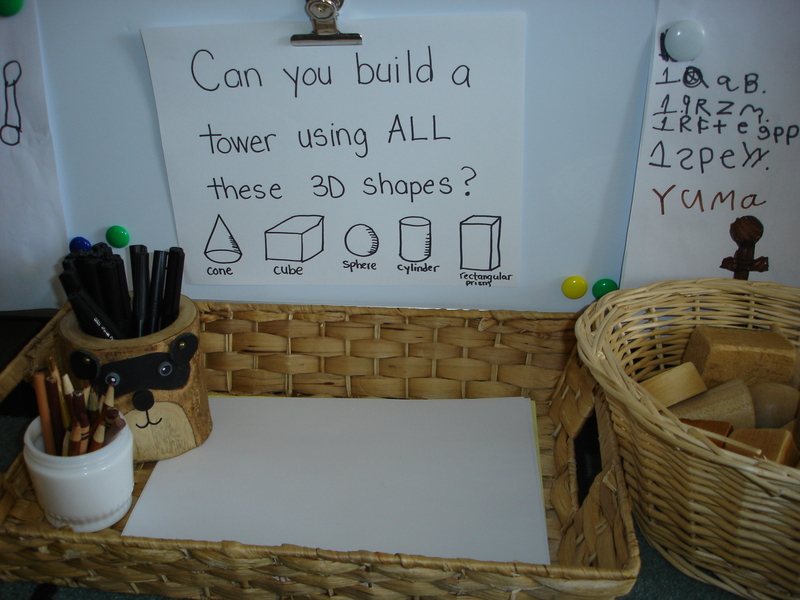 I put all the necessary materials at the math centre: clipboards, pencils/pens, sticky notes, an iPad, a basket of 3D solids. 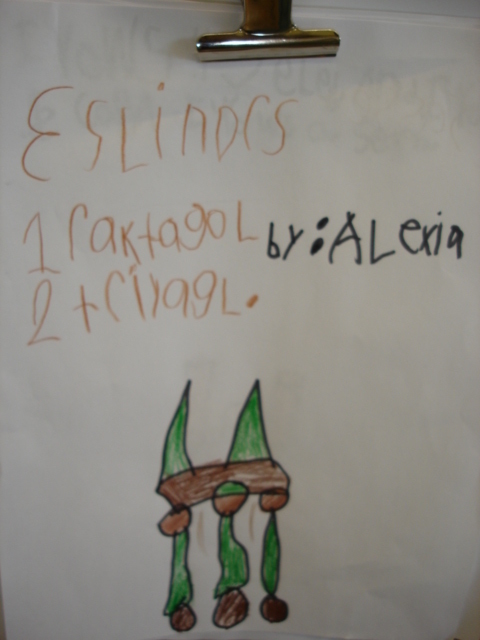 I also asked the children to self-document their learning with the iPad and/or the writing materials. 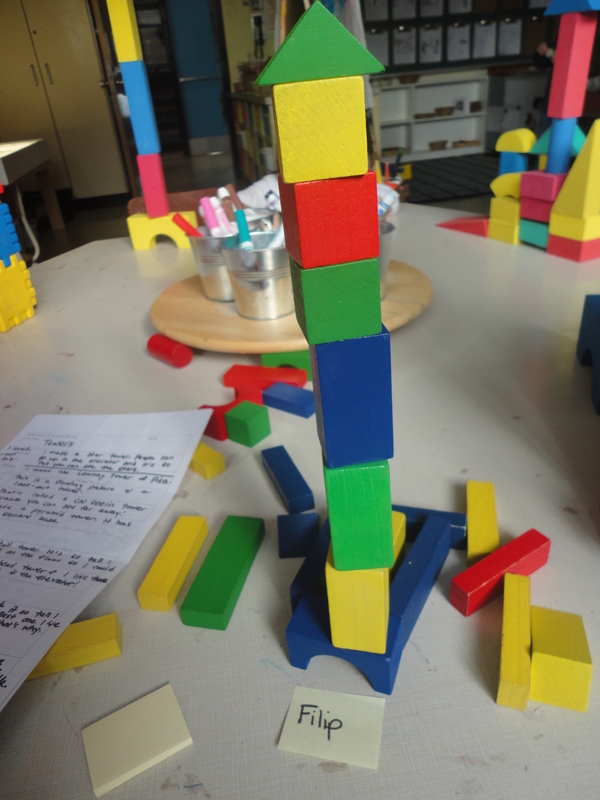 While several children visited the centre and were eager to share their learning about how they were able to stack the shapes (based on their properties), I noticed there was a group of children who didn’t seem interested in this centre at all. I usually encourage the children to self-select their centres based on their interests, but there are some centres which I would like all the children to try at some point. In my experience, most children will eventually want to come and see what a centre is all about, especially after we talk about it during reflection time and other children share their learning problems/successes. At the beginning of the week, however, I was starting to question whether or not my provocation/question for the students was engaging enough for all my learners. It became clear that some students may need more of a challenge. 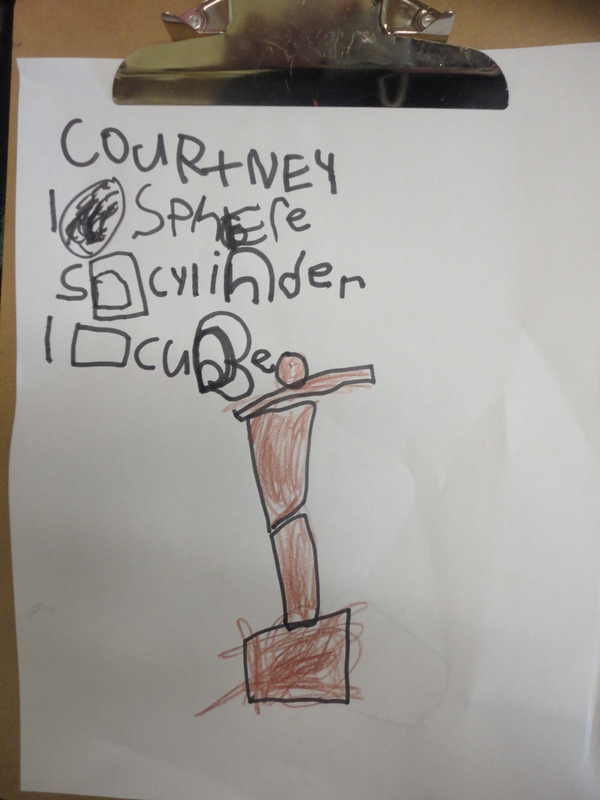 During the course of our reflection time, we noticed that no one in the class had used a sphere in their tower. Why was this? 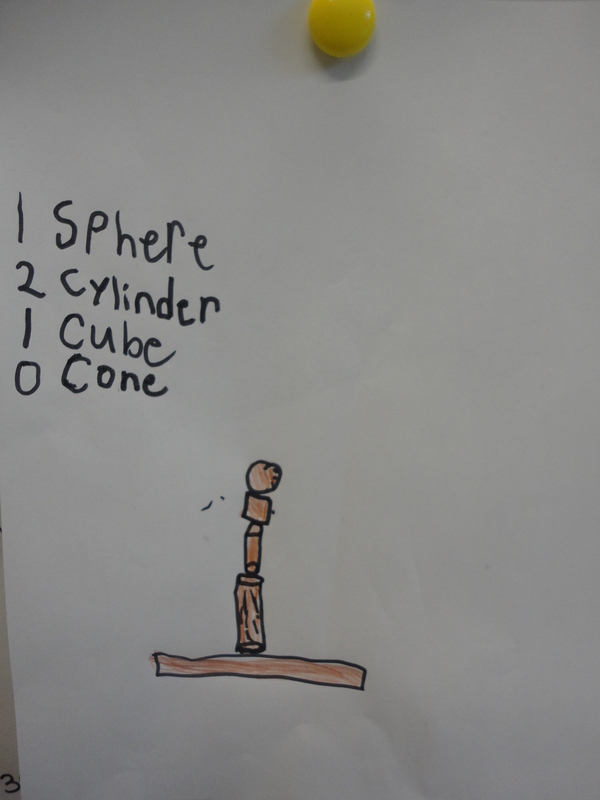 The children all agreed that there was no way a sphere could be used in a tower design (“It’s too rolly polly!,” “It doesn’t have any flat sides!,” “It won’t balance.”). After this conversation, I issued a challenge to the class: let’s see if anyone can build a tower using ALL of the different 3D shapes. 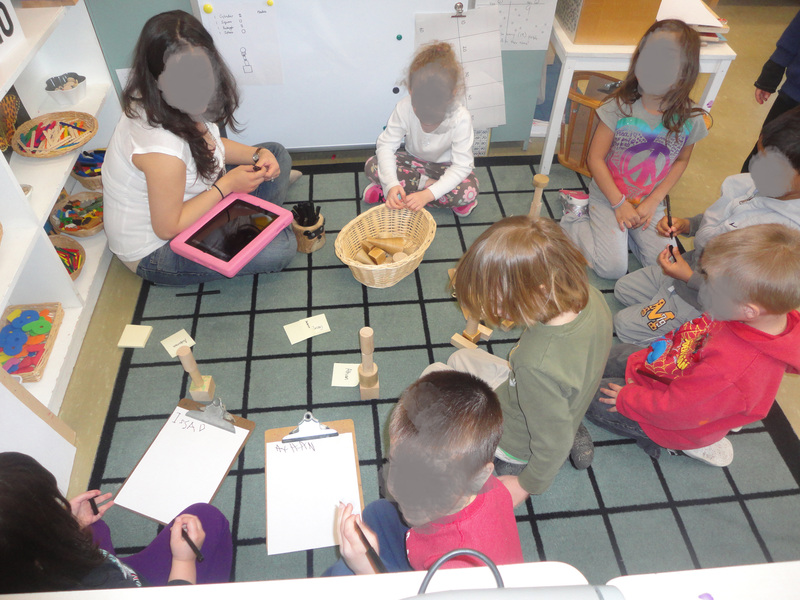 Interestingly, the group of children who had not been at all interested in visiting the math centre suddenly chose it as their first choice during discovery time. In fact, the math centre went from having two or three children in it at a time to being completely jam packed. 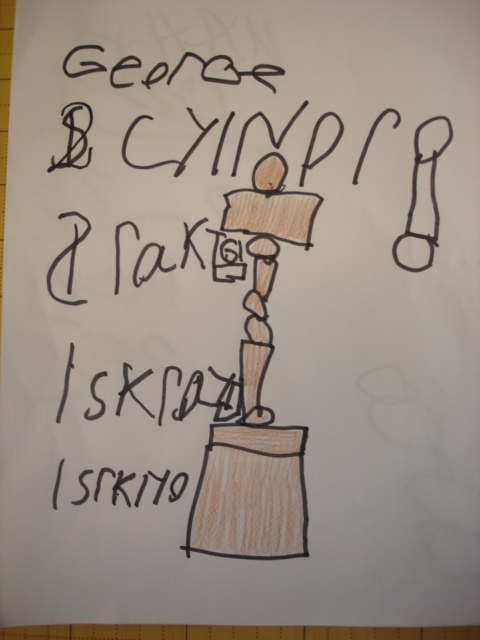 It seems that in this case, some children needed the promise of a challenge to spark their interest and creativity. 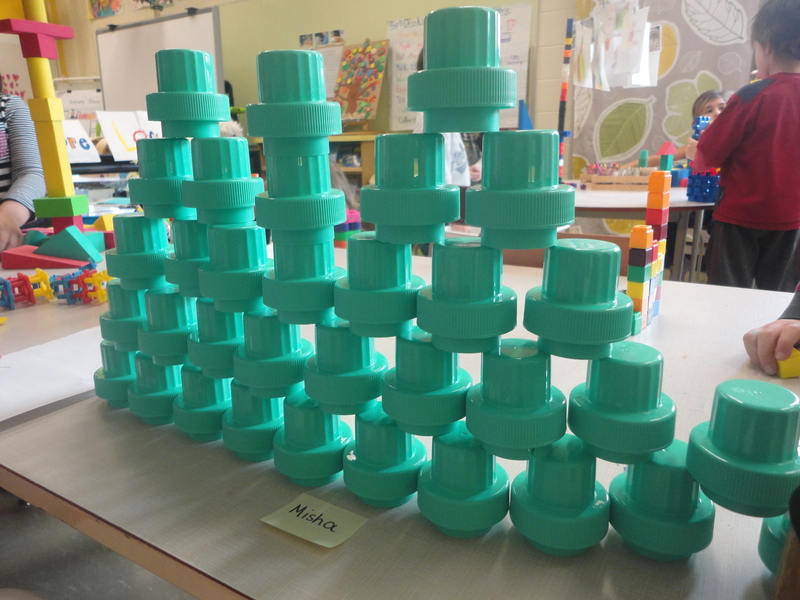 The children discovered that indeed it was possible to build a tower using a sphere (“You have to put it at the top because nothing else will balance on it.”) and many interesting reflections were had about strategies for using all the shapes, how the properties of the shapes affected the planning process, and how the children were inspired by their classmates’ ideas. 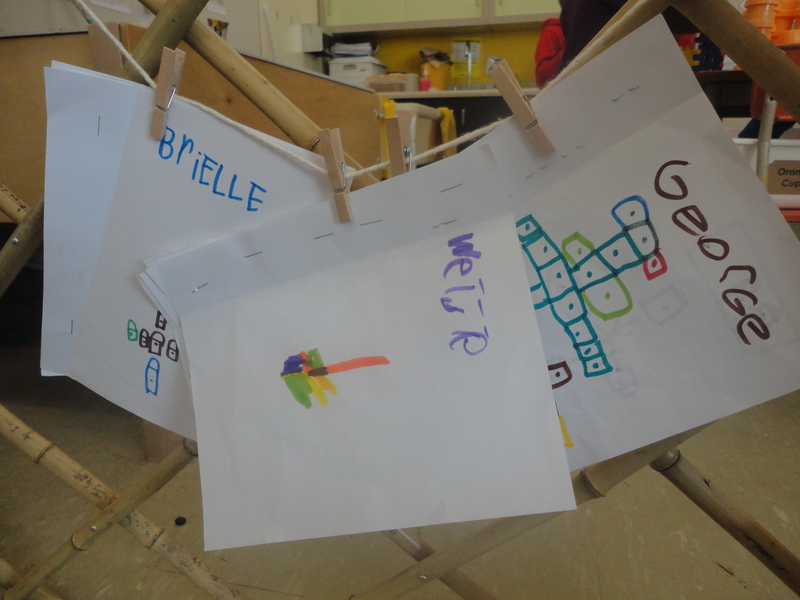 It was interesting for me to look back on this exploration as a reminder that provocations evolve and change as the children engage (or in this case, don’t engage) with the materials I have provided for them. This is a part of my pedagogy I want to keep in mind as I make plans for the upcoming year. 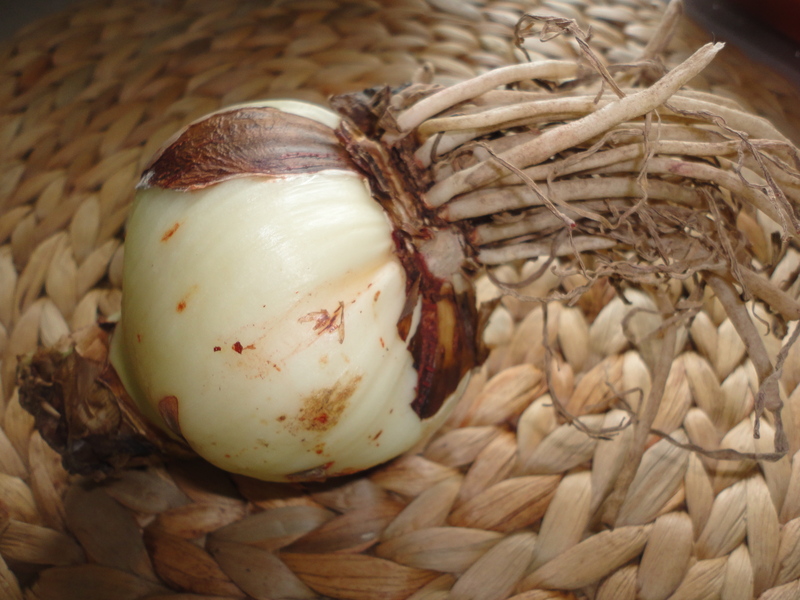 What can you do with one Amaryllis bulb? It turns out, quite a lot! 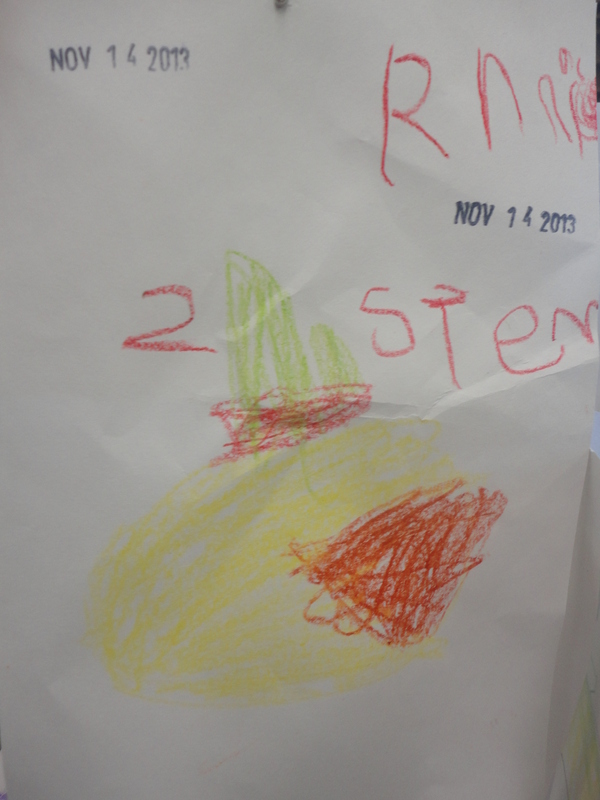 One of the questions I often get about choosing an emergent, inquiry-based program is “How do you make sure you still cover all the learning expectations laid out in the Kindergarten curriculum?” This inquiry turned out to be a great example of how an inquiry-based approach to learning can help you cluster learning goals and expectations with effective results! 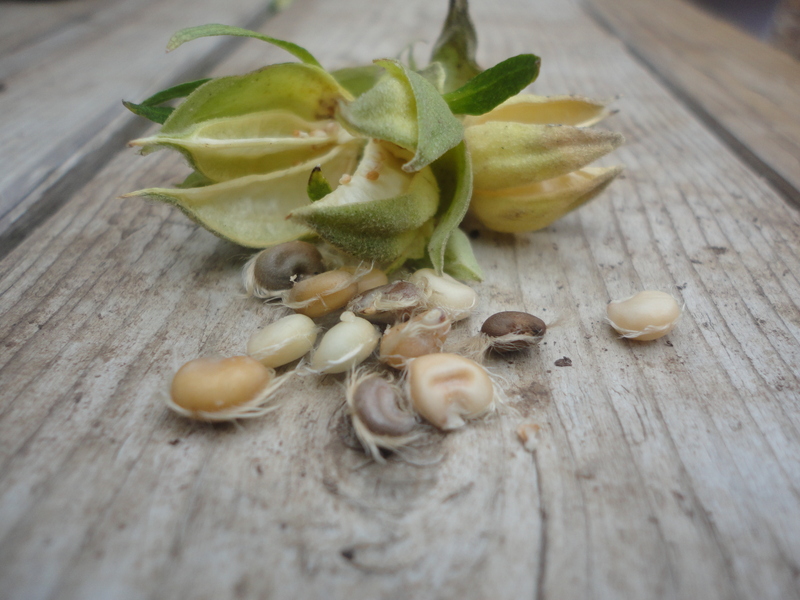 In the fall, our students made an exciting discovery in the courtyard: seeds! Our beautiful Rose of Sharon bush had gone to sleep for the winter and left behind some interesting pods which, when the children opened them, were found to contain “little fuzzy seeds.” This discovery led to many wonderings about plants, seeds, and growing things. At the science and nature table, the children tried planting the seeds from the Rose of Sharon, orange seeds, and apple seeds. Anything they could find! I happened to have received an Amaryllis bulb as a gift, and I added it to the collection of “growing things” on our table. We planted the bulb and excitedly waited for something to happen. After the weekend, we noticed something green poking out of the bulb! 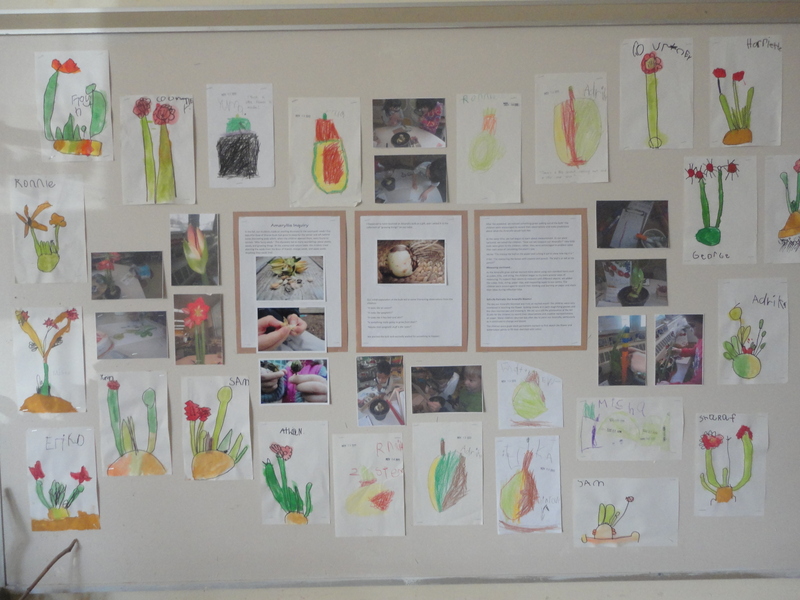 The children were encouraged to record their observations and make predictions about what the Amaryllis would look like. 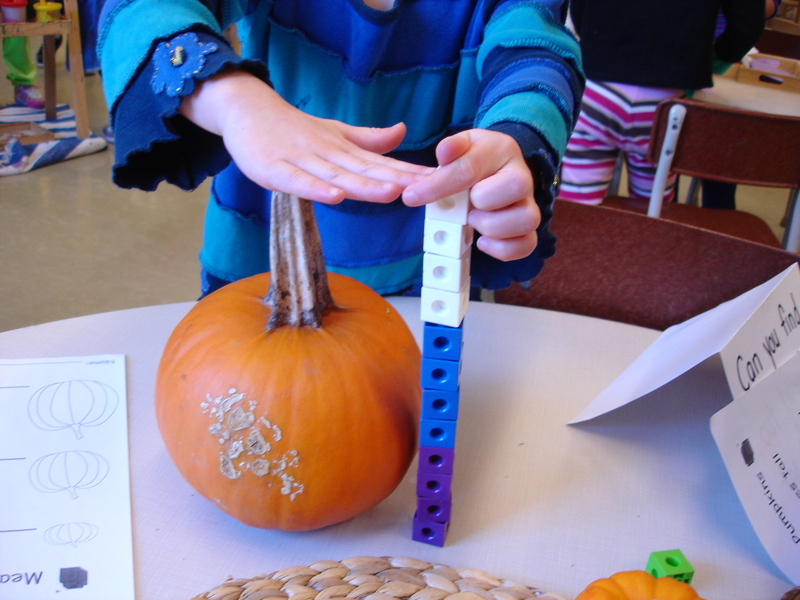 At the same time, we had begun to learn about measurement. 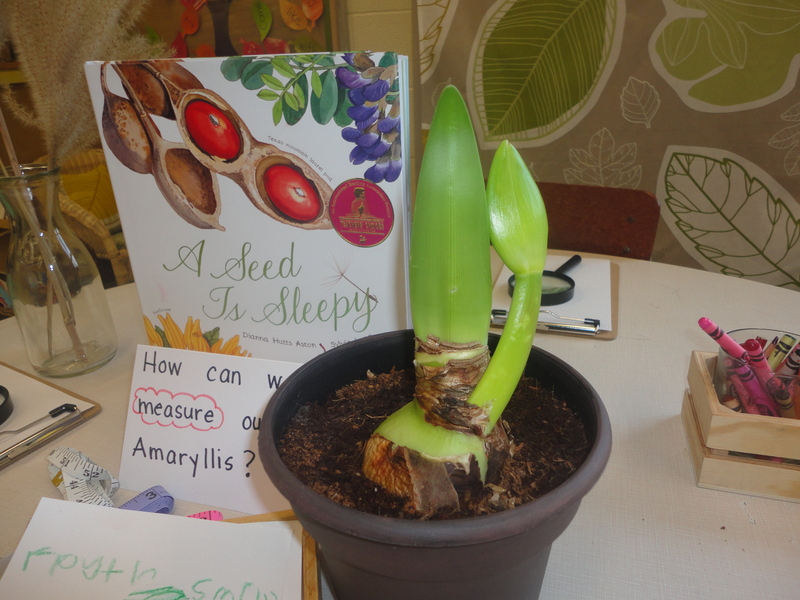 As our plant sprouted, we asked the children: “How can we measure our Amaryllis?” Very few tools were given to the children; rather, they were encouraged to problem solve their own ways of calculating the plant’s size. 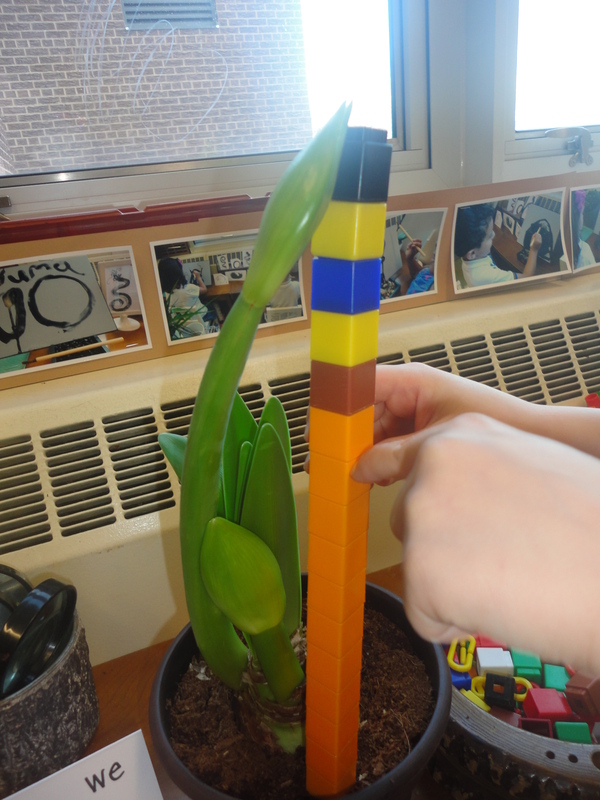 As the Amaryllis grew and we learned more about using non-standard measurement tools such as cubes, links, and string, the children began to try more precise ways of measuring. 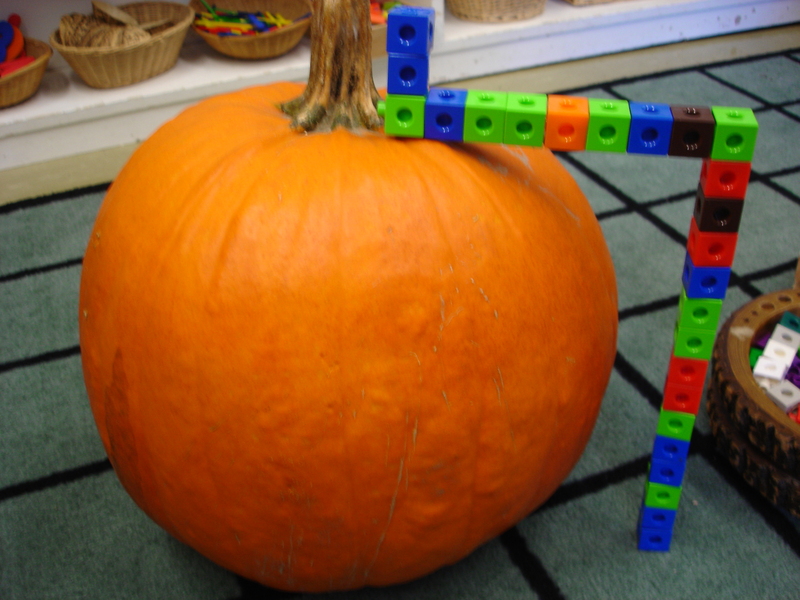 To support their desire to measure with different objects, we added the cubes, links, string, paper clips, and measuring tapes to our centre. 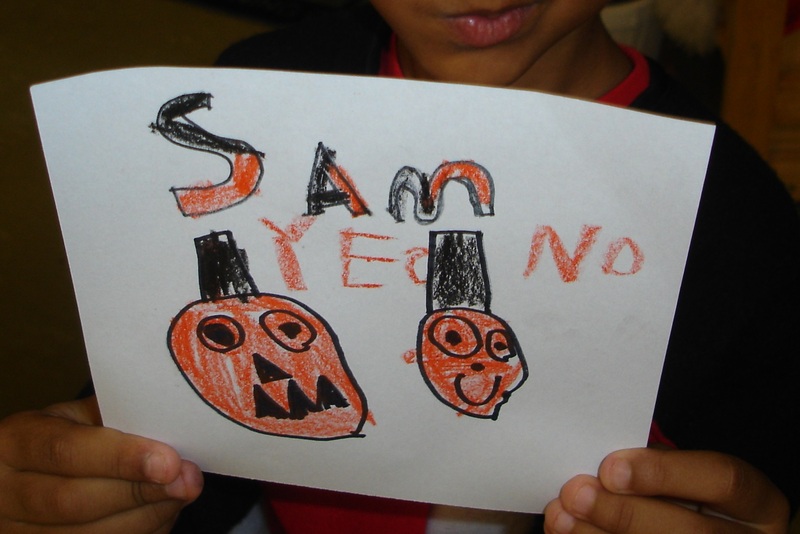 The children were encouraged to record their thinking and learning on paper and share their ideas during reflection time. 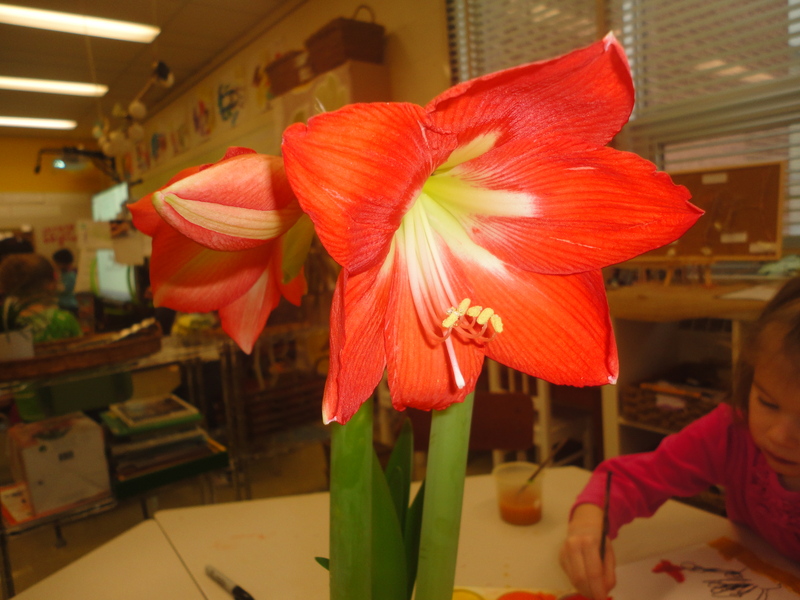 The day our Amaryllis bloomed was truly an exciting event! 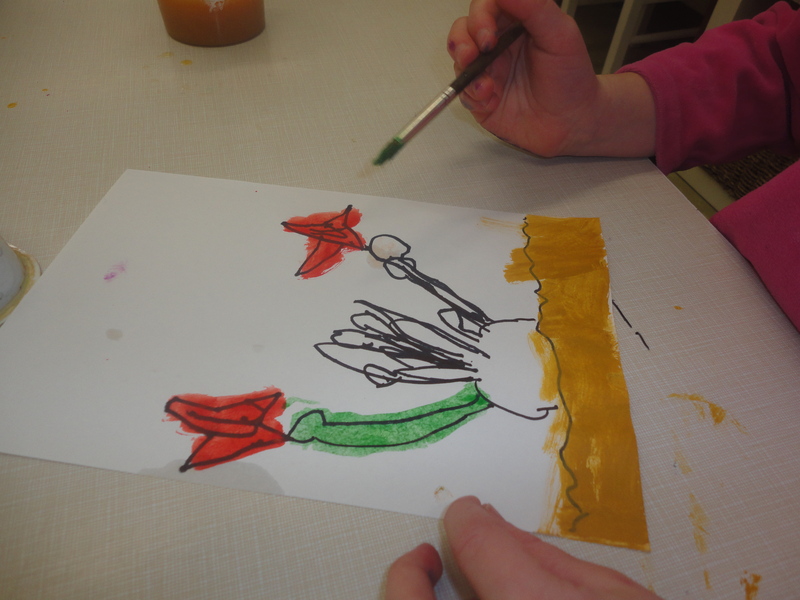 The children were very interested in touching the flower, looking closely at it (with magnifying glasses and the class microscope), and drawing it. 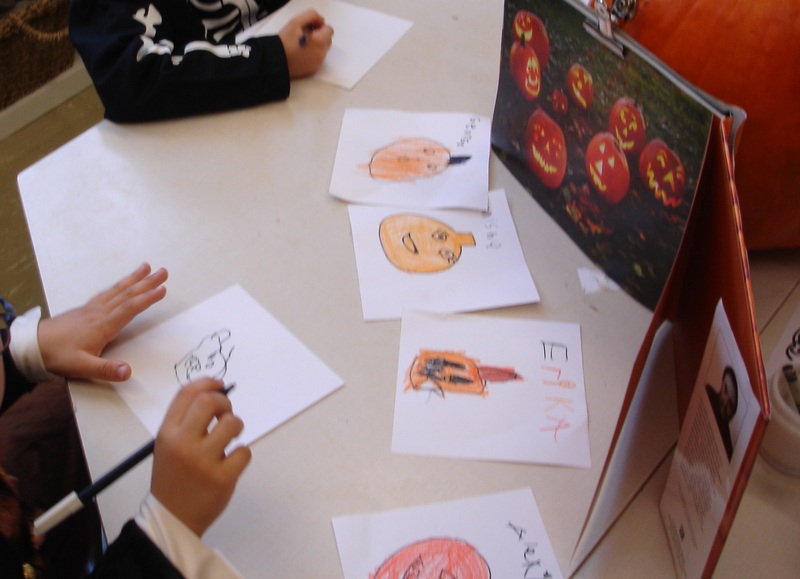 We set up a still-life provocation at the Art Studio for the children to record their observations and creative representations on paper. 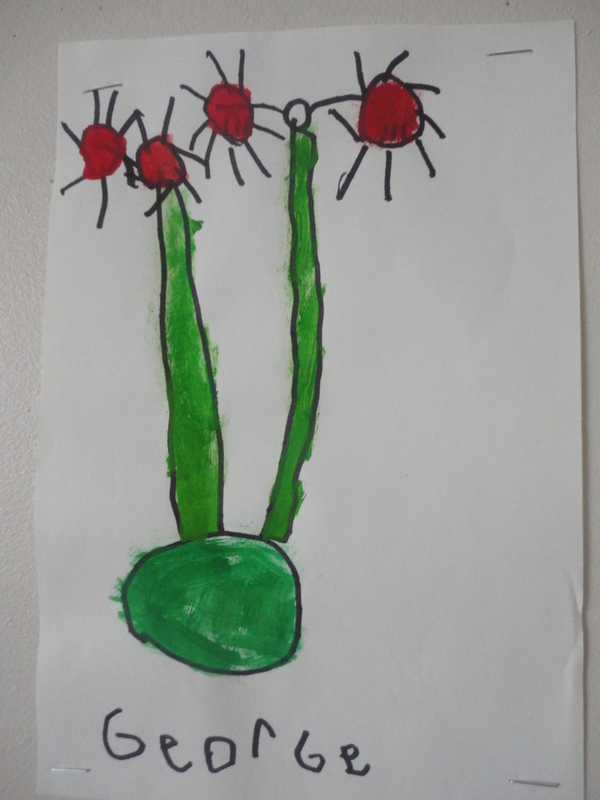 Many children returned day after day to paint our Amaryllis as it continued to change and bloom. 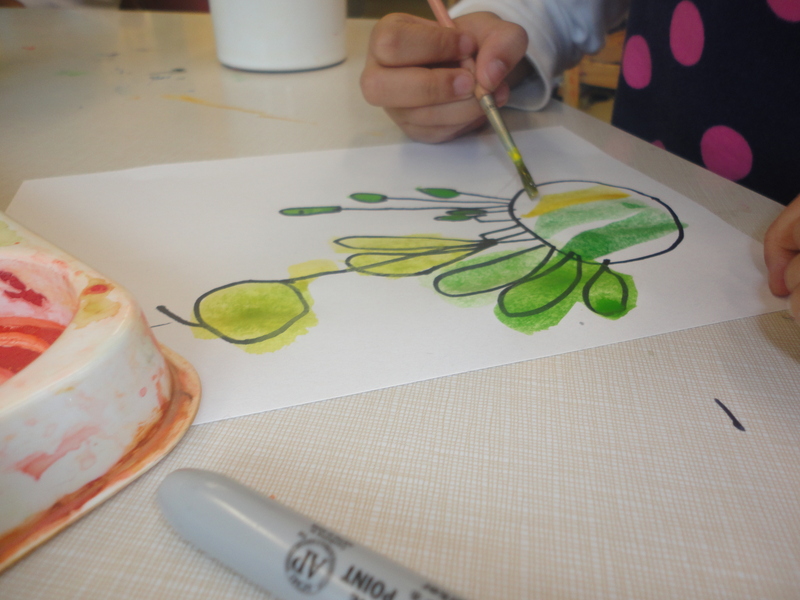 The children were given black permanent markers to first sketch the flower and watercolour paints to fill their sketches with colour. 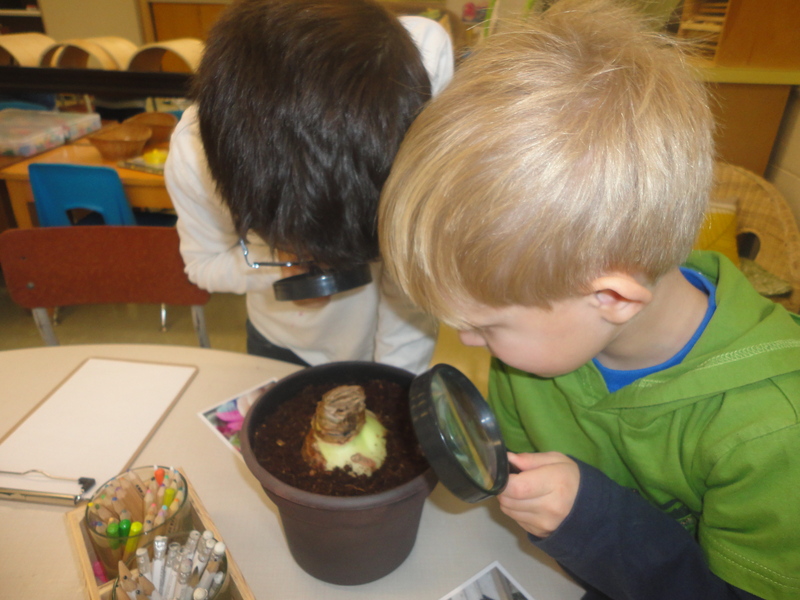 From start to finish, our Amaryllis inquiry touched on learning expectations in literacy, mathematics, science and technology, and art. 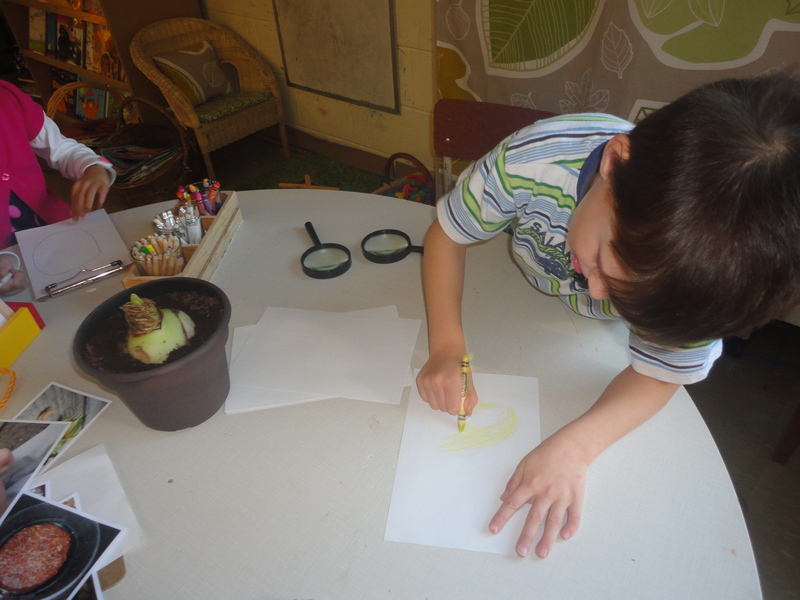 I was able to gather information and assessment on the children’s ability to make observations and predictions, communicate their thinking orally and in drawings and art works, demonstrate their problem solving skills and knowledge of measurement, and learn about the needs of living things and how plants grow. Because our exploration originated from the children’s natural interest in seeds and how things grow, there was a high level of engagement throughout the project. 1) I teach a mini lesson on the day’s focus. 2) Each student gets their own bin of building materials (blocks, connectors, cups, etc.) and takes it to a table. The bin goes on the chair and the children stand at the table and build. I circulate and facilitate discussion, pose questions, take notes, take photographs. 3) Reflection. I post pictures of interesting structures for discussion and feedback. We engage in M.S.I. as an entire class, one period per week. 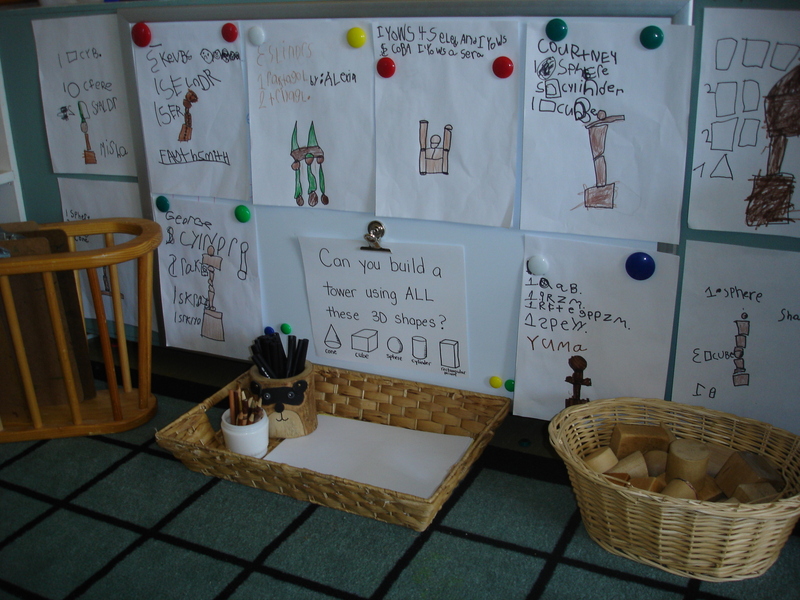 That being said, the building bins are always available during discovery time and it is common to find children selecting them to continue working on an inquiry we are engaged in. 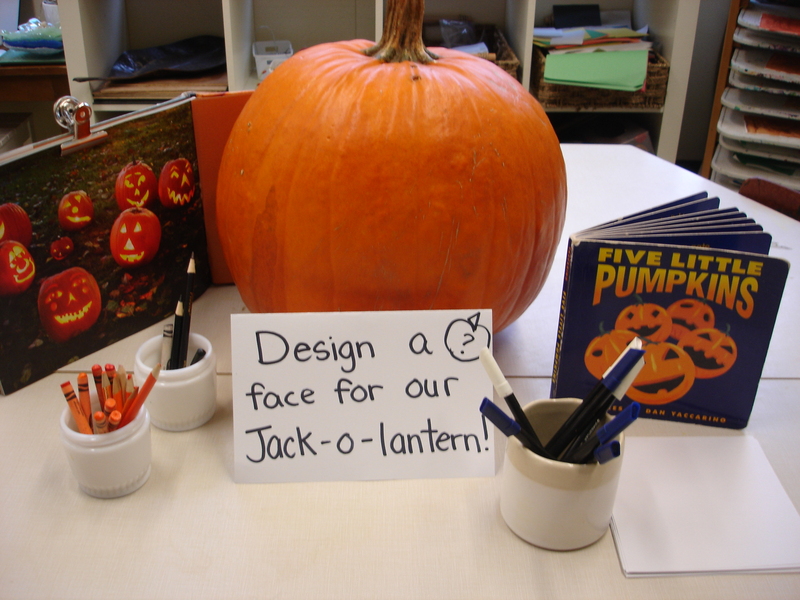 We also often find ourselves setting up provocations that support the learning that is happening in M.S.I., due to significant student interest. Q: What kind of materials do you use? How do you organize enough bins for each child to have one? 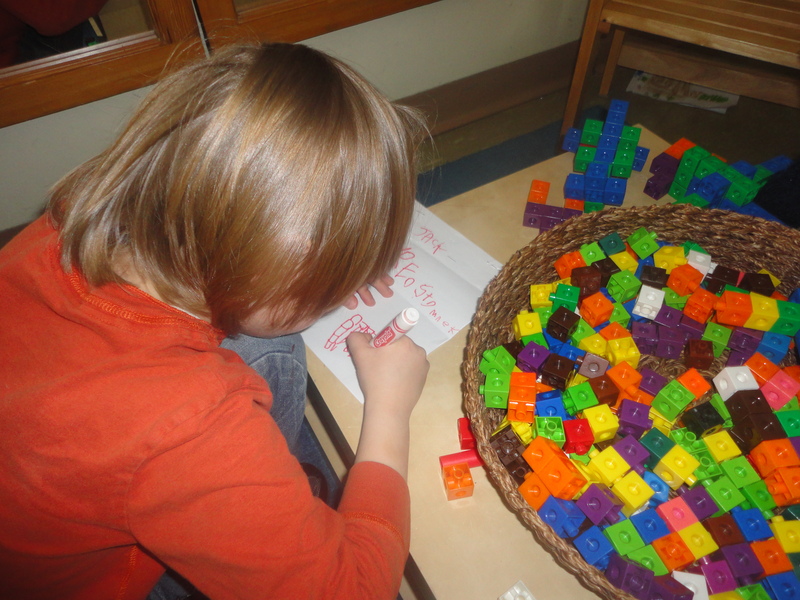 A: We use a variety of store-bought traditional building blocks and some found materials to make up our bins. Wooden blocks, tree blocks, better blocks (kind of like Duplo), foam blocks, cups (laundry caps) from the recycling depot, anything that will stack! I purchased some materials from school catalogues, found others at garage sales and recycling stores, and got some for free from the recycling depot in our school board. Anything that can stack reasonably well is a good material for M.S.I. If you don’t have enough for everyone in your class you could always run the program with children working in partners or groups, and we sometimes do this as well depending on the focus of the lesson. Q: What about space? Where do you store your materials? What if you don’t have enough table space for each student? 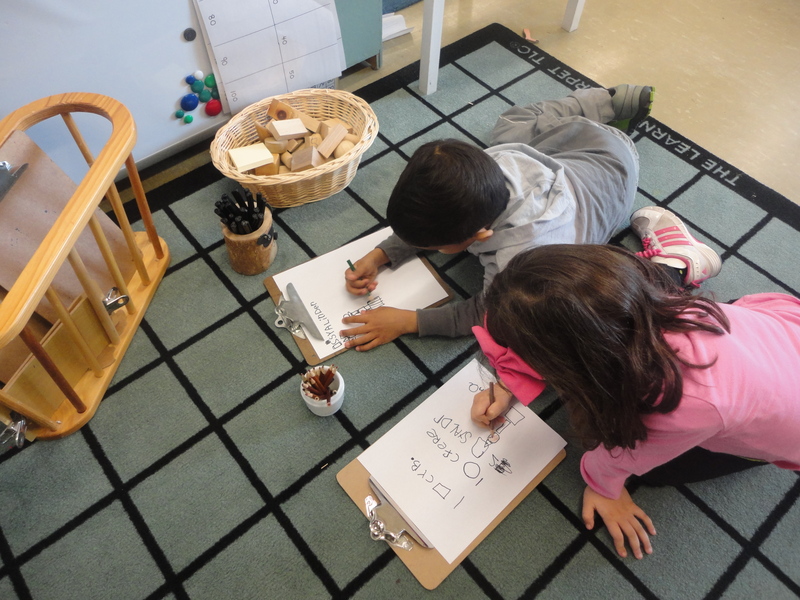 If you don’t have enough table space for each student to have their own spot, children can build on the floor. 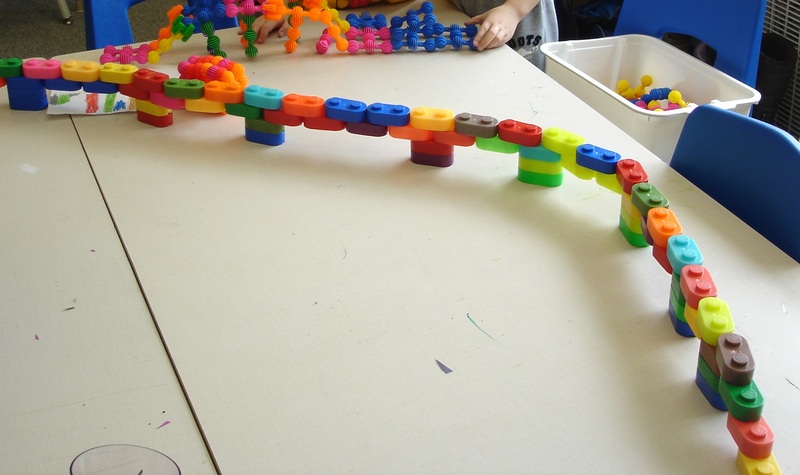 The idea behind standing and building at a table is that children are initially encouraged to build up with their materials. 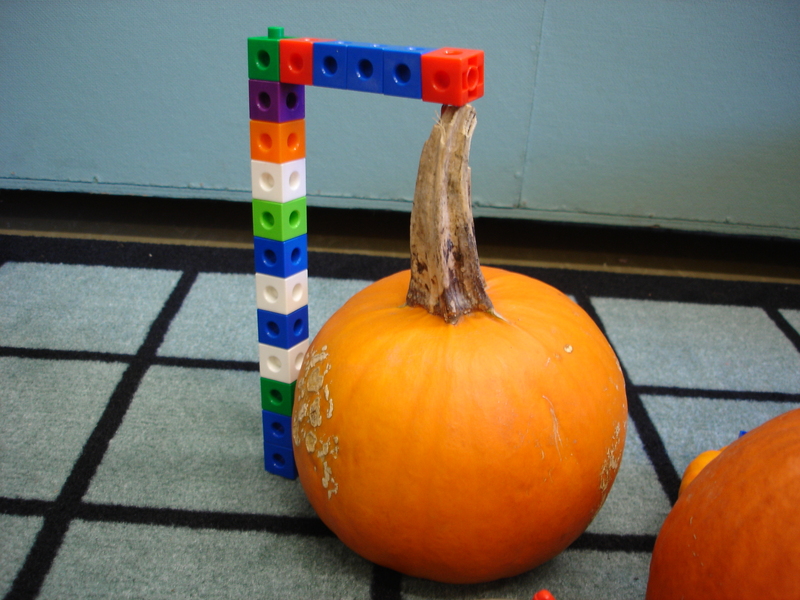 Standing helps the children stack their blocks more easily, and see their structure from all sides. Placing the building bin on a chair frees up table space for working. We store our building materials in two large rolling shelves. The shelves hold about 36 bins. I have a small space, but it’s not overwhelming in the classroom. 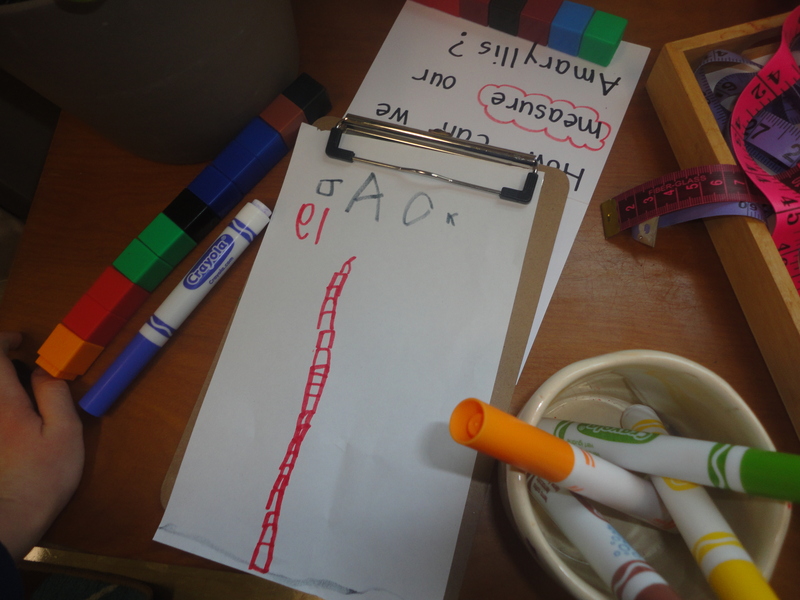 I saw another school where the three kindergarten classes shared their M.S.I materials on a rolling cart that was parked in the hallway and could be easily moved to each class. Q: What kinds of inquiries have you done? How long does one inquiry last? 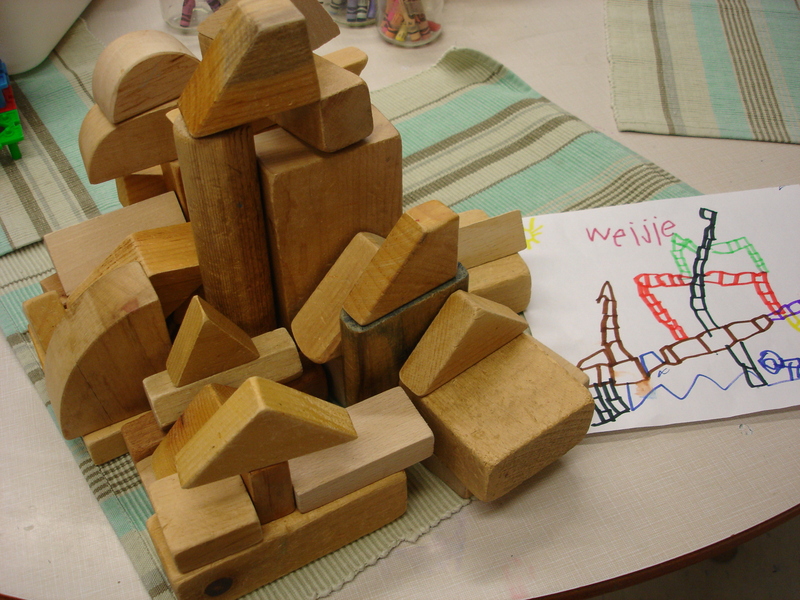 A: The resource Building Structures With Young Children focuses on two inquiries: Towers and Enclosures. This year we have completed a Tower Inquiry (which I will write more about soon) and are now working on enclosures. We have also done inquiries on bridges and castles. 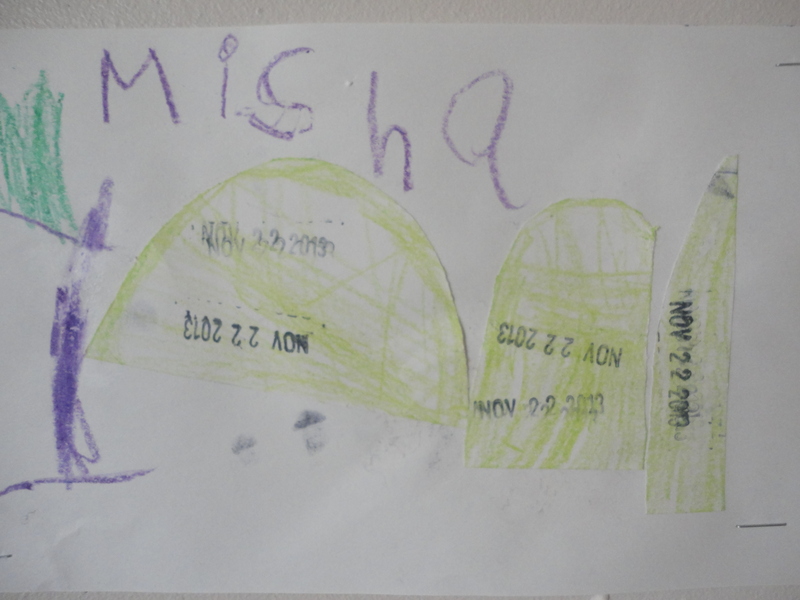 In one school year, we usually have time to complete at least 2 large structure inquiries through M.S.I. Q: How is M.S.I introduced? What does it look like at the beginning of the year? A: At the beginning of the year, M.S.I. time is mainly spent establishing routines and working on basic concepts of space, balance, making a plan, etc. There is a lot to be said just for helping the children locate a bin, find their own work space, build, and then tidy up. A lot of time also goes into establishing routines and expectations for sharing and reflecting on our structures at the end of the lesson. The most important part of the initial phase of M.S.I. is exploration and helping the children stay focused on solving problems rather than getting frustrated if/when their structure falls down. The children are often encouraged to choose different bins regularly to get a feel for the variety of materials we have available. 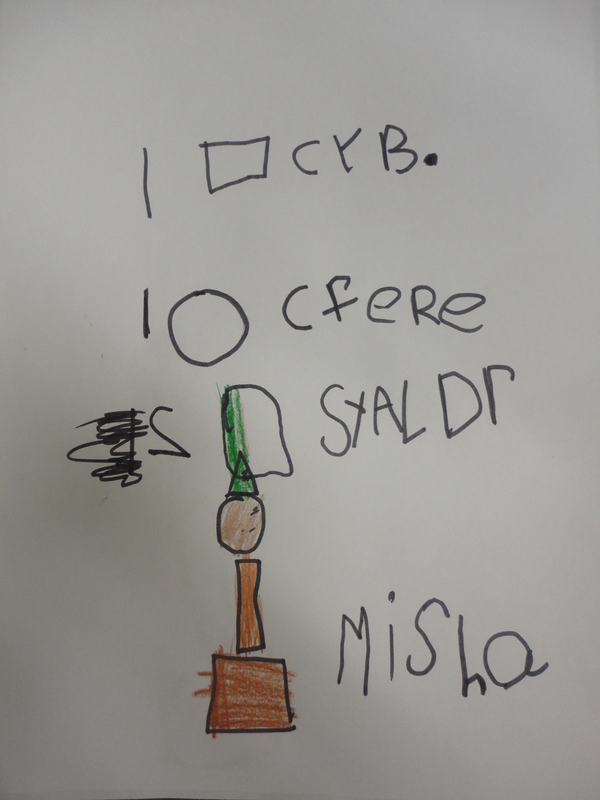 I have to say, the children are always excited to see M.S.I. on the schedule. I continue to be amazed at how reflective and thoughtful they are about their structures and how mature they appear when giving feedback and suggestions to their classmates during reflection time. Although when I started teaching I successfully ran an M.S.I. program without a lot of fancy technology (none, actually), the access we now have to iPads, a classroom camera, and an interactive SMARTBoard have helped me take our building program to a whole new level. 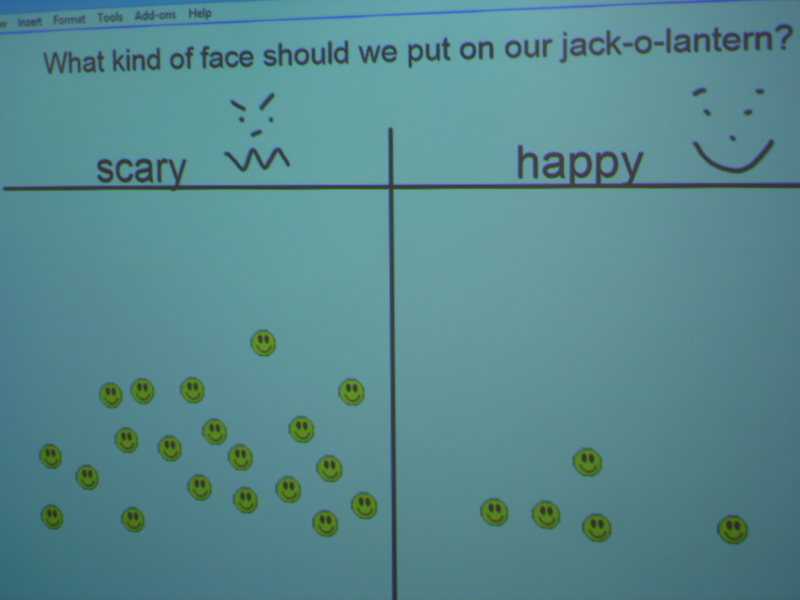 Being able to take a photo of a child’s structure and immediately post it on the SMARTboard for us to discuss is an invaluable part of the program. 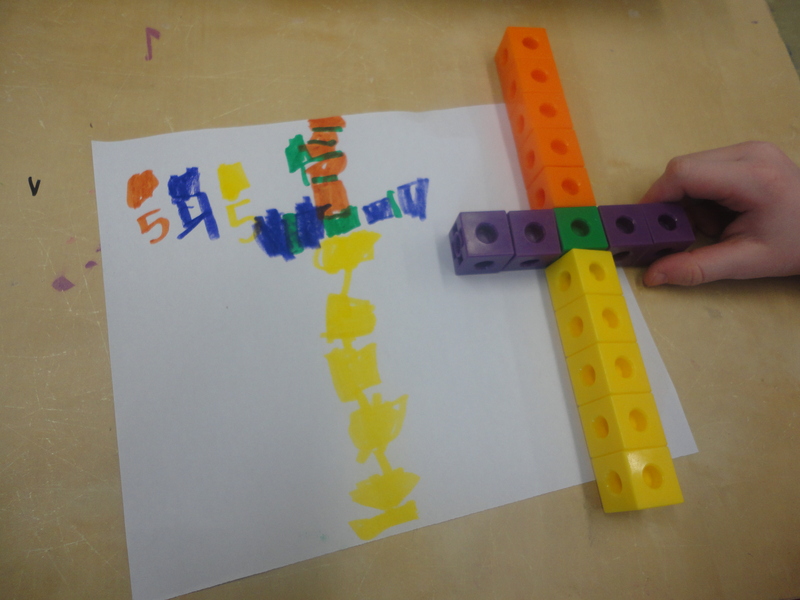 We regularly use the SMARTBoard pens to label the structure in the photo, highlight shapes in the design of the structure or draw on possible ideas to add next time. If you have any other questions about how M.S.I. works, please don’t hesitate to drop me a line! 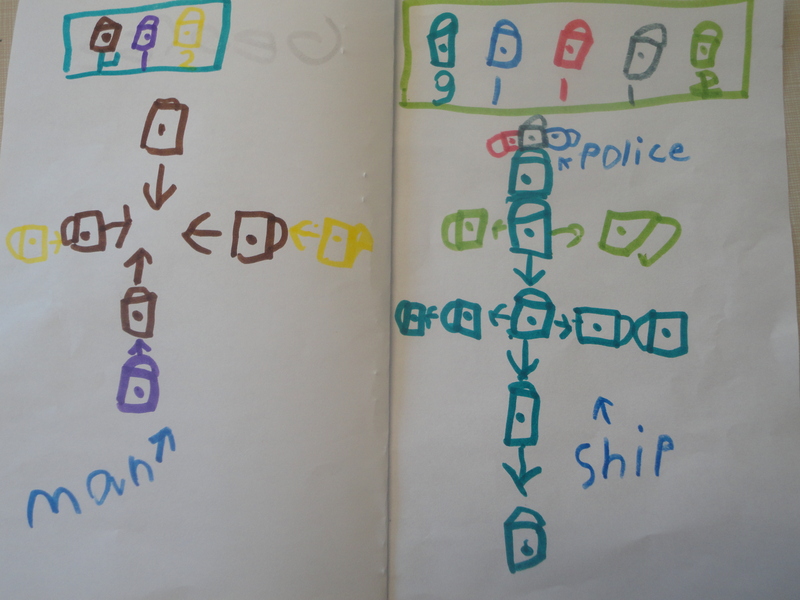 Lately I’ve been looking for ways to extend the learning that has been happening at my small building centre. Basically, snap cubes have taken over our classroom. 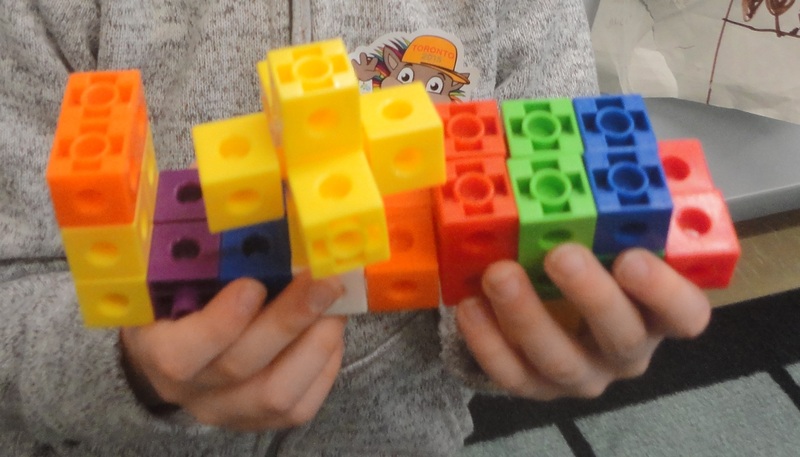 What started as a daily activity by a small group of boys soon spread into a full-on class obsession with all things related to building with this “Lego-like” material. Although I was completely amazed and inspired with what the children were able to construct with their snap cubes, how they problem-solved and worked together, and how they presented their discoveries and creations with the class, I’ll admit there have been times when I struggled with the snap cube craze in my classroom. 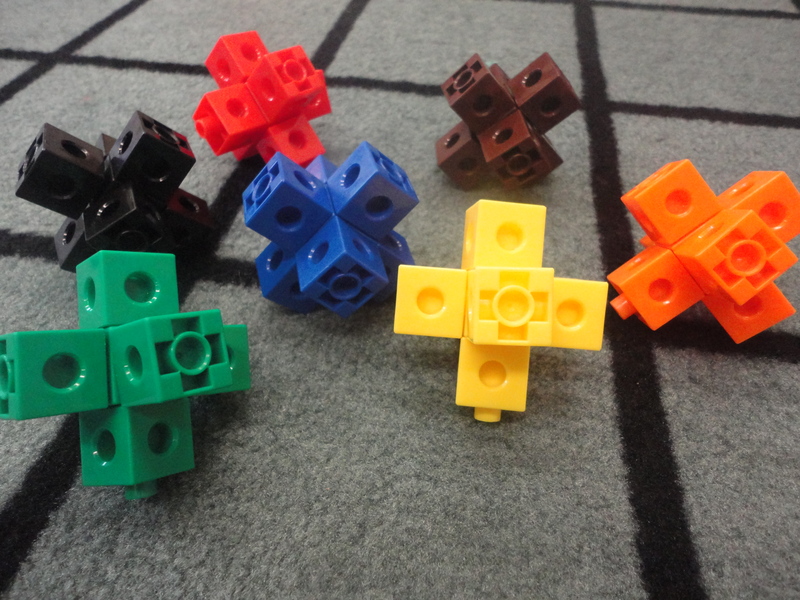 There were certainly children that worked with snap cubes and only snap cubes, children that fought over having a turn there, and children who turned their noses up at the carefully organized provocations we put out at other centres. In the end, we decided to embrace the interest in snap cubes. 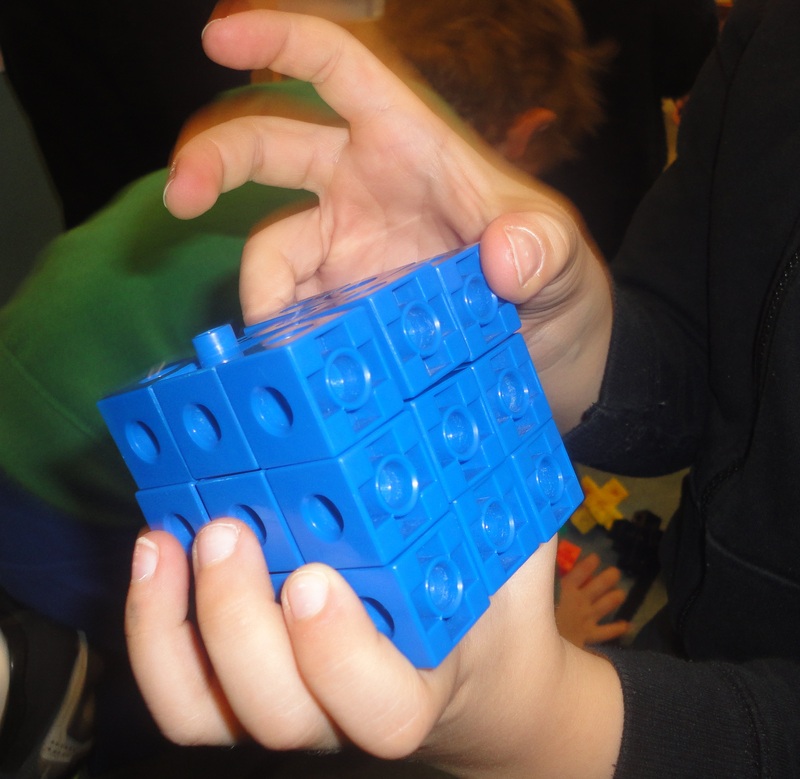 We moved them to their own centre (a Snap Cube Building Workshop) and, after some discussions with the class about balance and fairness, noticed that the children were able to make better choices about when to visit the snap cube centre and when to try something new. 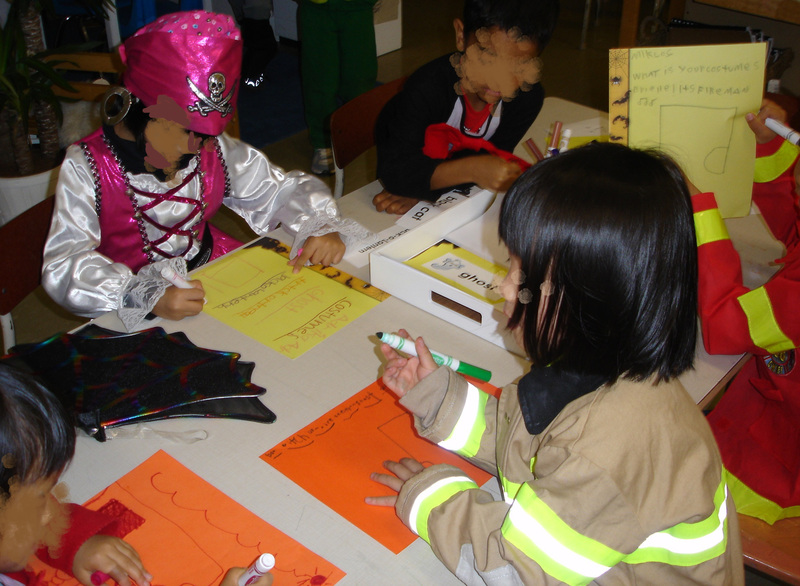 Does your class have an activity or material that your students just can’t put down? How did you embrace the children’s interests?